London, England (June 21, 2016) – Morse Watchmans is introducing enhancements to its KeyWatcher Touch that are designed to make the key management system even more secure and more useful for today’s business needs. New features being presented at IFSEC include security and notification upgrades and ease of use improvements, all driven by real-world customer feedback. New security features protect the system from cyber breaches via the network. With the firewall enabled, all incoming traffic is ignored unless it is on the specific ports the system requires for network and server communication. The data between the KeyWatcher Touch and the KeyWatcher Touch Server can now be encrypted with AES256 technology with a pre-shared key that is definable on a site by site basis. For further operational convenience, a number of additional upgrades have been implemented. Now KeyWatcher Touch Server service can run under a domain user account. Windows authentication is now supported for SQL, while server logins eliminate the need for the IT department to add SQL users to the SQL Server for the purpose of authentication. The KeyPro™ III software import utility has been revamped to make it easier to use; for example, imports can now be performed as needed rather than having to complete them all up front. Day-to-day user conveniences have also been upgraded including the ability to replace keys from TrueTouch™ key tracking software using the SmartKey reader. A new notification that allows for users to be notified when an overdue key has been returned is also included, as well as notifications for dual and triple user removals/returns. All reports in TrueTouch now support being saved/viewed as a PDF, or saved as a CSV file. 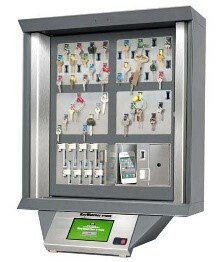 With these updates, KeyWatcher Touch makes key control for the enterprise safer, easier and more convenient.